If “The System Is Rigged,” as More and More of Us Probably Believe, What Do You Do? Where Do You Wind up on the Spectrum of Possible Reactions? 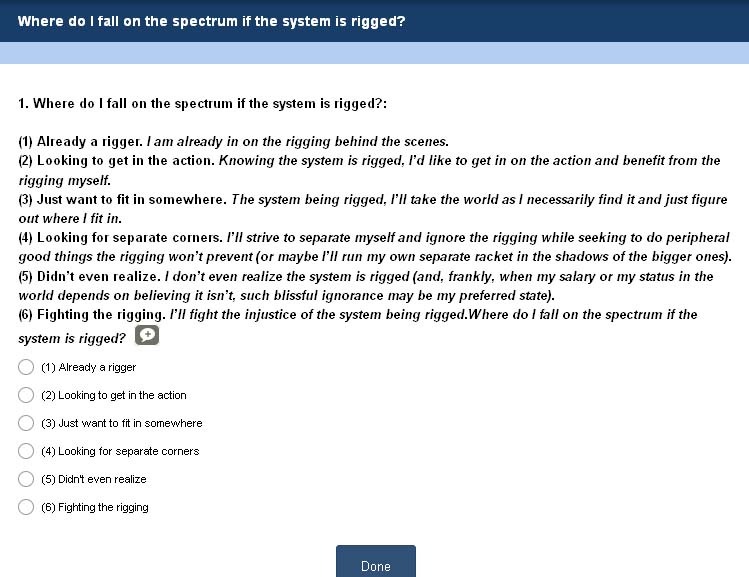 If the system is rigged, where do you fit in on the spectrum. You can take the poll down below and find out how other people are answering the question. If “the system is rigged,” what do you do about it? There is a range of responses people might have. First: “Is the system rigged”?. . . Is that something people now believe, and what might we mean by that? A good indicator that many people now believe the system is rigged is how many candidates that ran for office in the recent presidential race (pretty much all the candidates of significance), Jeb Bush, Bernie Sanders, Hillary Clinton and Donald Trump were chasing votes by saying the system is rigged. There is the sense, borne out by much empirical evidence, that no matter what efforts you as a typical citizen undertake to change things you won’t have an effect. Go out to work for Bernie, give him money? : The corporately-owned mainstream media will refuse to cover Bernie’s campaign and will side-step talking about the issues he presses. Mobilize your New York City neighborhoods to testify overwhelmingly against the sale of public assets like libraries? : The politicians you worked to elect while they proclaimed they would protect these public properties will blithely and deaf to the public hand the real estate industry exactly what it wants. Does it make you feel neutralized? Do you feel like you are expected to surrender to the preordained decisions made by the powers that be? Given the “deep state’s” status as officially secret, its entrenched strategies of deception generally acknowledged to be its standard M.O., and that it is unaccountable and doesn’t give official interviews, who can reliably say what the “deep state” wants or where it steers us? We can only guess. If it were not for the recently emerged narrative of Donald Trump as a “disruptor” at odds with the “deep state,” it would be easy to imagine the “deep state,” whatever its intentions, is in firm control by those powers that be. This is not to say that things aren’t odd right now. The current narrative of Trump as president at loggerheads with the “deep state” has floated the idea that the “deep state” could be praised as a sort of naturally intended fifth estate protective of our balance of powers, virtually an essential ingredient of a functioning democracy, while, at the same time, the far right wing is styling the “deep state” as creation of the “progressive left” rather than the generally accepted notion that it’s an extension of the military-industrial-surveillance complex. Enough: We digress too much. Different people have different ideas of the exact structures that rig the system. Generally it is a follow-the-money proposition. . . . In this city, for Noticing New York purposes, that’s a path that takes you to the real estate industry’s doorstep (and for all the furious distractions of Mr. Trump at the national level, the real estate industry is still in charge in NYC, probably even more firmly, while we are still destroying the world’s climate with global warming and concurrently sleep-walking through the longest, most expensive wars in the nation’s history). . . The question here presented for this simple post is: How do we react when the system is rigged? What are the possible reactions when you conclude that the system has been formidably rigged, that it is set up to only to serve those rigging it at the expense of everyone else? There is a spectrum. If the system is rigged where might you fall? Here are possibilities and to make it fun, we have set this up as a poll that our readers may take . .
• Already a rigger. I am already in on the rigging behind the scenes. • Looking to get in the action. 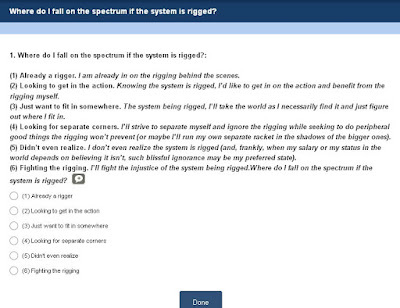 Knowing the system is rigged, I’d like to get in on the action and benefit from the rigging myself. • Just want to fit in somewhere. The system being rigged, I’ll take the world as I necessarily find it and just figure out where I fit in. • Looking for separate corners. I’ll strive to separate myself and ignore the rigging while seeking to do peripheral good things the rigging won’t prevent (or maybe I’ll run my own separate racket in the shadows of the bigger ones). • Fighting the rigging. I’ll fight the injustice of the system being rigged. As you take this poll, answering the question for yourself, you might also speculate where you think our New York City (and maybe our New York State) elected officials fit in on this spectrum, what answers they would give about the choices they have made if they were answering honestly.